Now ReadingDo You Know About NYC’s Secret Lox Market? Do You Know About NYC’s Secret Lox Market? Everything about Acme’s Fish Friday sale is quintessentially New York: It’s a horribly kept “secret,” it’s an amazing deal…and lox is involved. A New Yorker’s bagel order is sacred, like a window to our soul; for many of us, breakfast isn’t so much a meal as it is a ritual. So when the cost of said morning ritual can be potentially slashed in half, we’ll leave the full-price pastrami salmon for the tourist goyim. New York appetizing shops have been selling smoked fish for decades, but a lot of the lox they’re selling doesn’t have to travel very far from the source: Acme, the largest producer of smoked fish in the country, has been processing Nova and whitefish in Greenpoint, Brooklyn, since 1954. (You've probably sampled its wares at spots like Barney Greengrass and Ess-a-Bagel.) And for about 20 years, Acme has been running Fish Fridays from its processing plant at prices almost 40 percent less than retail—which, as anyone who’s ever ordered a bagel spread for a group knows, can be expensive. So here’s the tea: Every Friday morning at 30 Gem St., from 8 a.m. to 1 p.m., Acme holds a direct-to-consumer fish sale at super discounted prices—cash only! The offerings are consistent each week, including products from the traditional Acme line as well as the company’s Blue Hill Bay, Ruby Bay and Great American brands. Sampling is encouraged, and the offerings range from classic Nova lox and whitefish salad to newer items like salmon and tuna poke. And by the way, this is not a don’t-order-fish-on-Monday situation: All the products sold at Fish Fridays are items that have not yet been packed for shipping, so it is truly the freshest lox you can buy. In fact, the sale takes place in the packing room of the warehouse, so other than Friday mornings, it’s where you’d find staff packing up and shipping out wholesale orders. Sure, you can go to Zabar’s any day of the week and pick up some pastrami salmon—but you could also make the trek to North Brooklyn on a Friday morning and pay almost half the price for fresher fish. On Fridays before Jewish High Holidays lines often wrap around the block, sometimes meaning hour-long wait times. But unlike sample sales, which are notoriously savage (enough so that Broad City spoofed it), Fish Fridays are exceptionally civil amongst both customers and employees. The clientele is eclectic, ranging from millennial locals to Hasidic Williamsburgers. Many customers are repeats and have a personal rapport with the Acme employees. (Having someone know us by our lox order? Goals.) 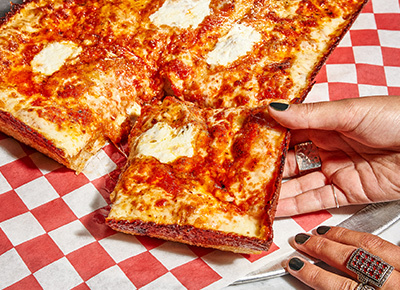 Even if pickled herring isn’t your thing, observing the only–in–New York novelty of people flocking to an industrial venue and finding community over seafood is well worth a trip on the G train.